Devices aim to help users working on projects with other parties via online portals or cloud computing. Oce PlotWave 360Canon has released details about the launch of the Océ PlotWave 340 and Océ PlotWave 360 printers. The devices are aimed at helping technical users working on projects with other parties via online portals, or the cloud, and who require more flexibility from their multifunctional printing system. The Océ PlotWave 340 and Océ PlotWave 360 feature the new Océ ClearConnect multi-touch user panel, which is similar to tablet technology. This said Canon enables operators to open a document, zoom in and out and pan to specific areas to check critical details. Operators are able to view a live “what you see is what you print” preview while scanning or copying, helping to avoid costly errors. Files can be pulled to the new Océ PlotWave printers from cloud-enabled workflows and scanned to the cloud of choice – simplifying workflows with remote project members. Users can also print files from a USB stick or other network locations. Those that need to access the new printers and print via a mobile device can do so using the Océ Publisher Mobile App. For more complex document sets, users can print from a desktop PC via Océ Publisher Select. The Océ PlotWave 340 and Océ PlotWave 360 have the capability of printing up to six plots in one minute. A special feature called Océ Radiant Fusing technology has been bundled with the printers to significantly reduce warm-up time. This added Canon means that from cold click to print-in-hand takes less than 40 seconds, compared to the four minutes typical of conventional printers. Both devices offer a high print resolution of 600 x 1200 dpi. 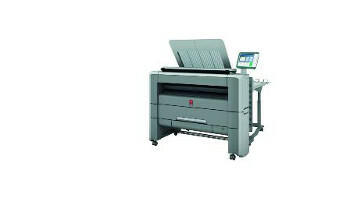 Concurrent operation capabilities enable the Océ PlotWave 340 and Océ PlotWave 360 to be used for printing while simultaneously copying or scanning.